I'm so happy to introduce my first contest and giveaway! Given the nature of the giveaway, I thought April Fools was the perfect day to broadcast all the details but I can assure you, this contest is no joke! Trust me, in this contest you'll want everyone laughing at you, not with you. Thanks to the brilliant people over at Awkward Family Photos, you have a general idea of the photo submissions we're looking for. Send me your best "less than professional" images that would never make it over the fireplace to best illustrate why you NEED to win a professional photography session. This contest is open to all sessions types, with the exception of wedding coverage. This is where you finally find use for that picture Uncle Larry took with his finger covering the lens and Dad blinking in every frame. Beginning today, Friday, April 1st and running through the weekend until 11:59PM Sunday evening, you can submit your entries. 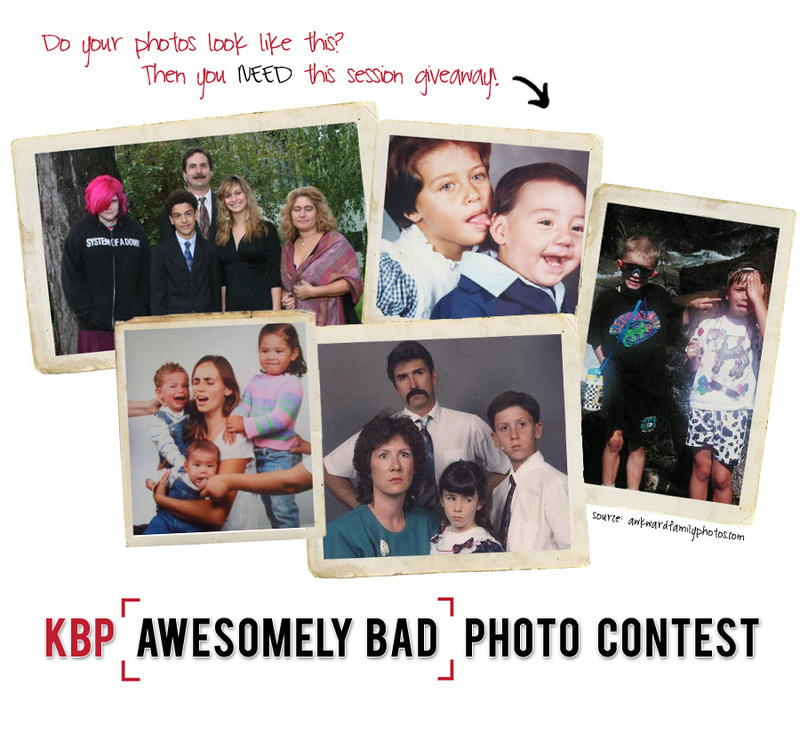 All images will be organized into a photo album on the KBP Facebook Page where you will need to spam your friends to get your image as many "Likes" as possible. The winner will win a free portrait session - a $200 value - to be redeemed at a later date! This contest is open to all potential clients in the Washington, D.C./Northern VA area only. Well, if you live in France, win the contest and pay for my airfare/lodging/sight seeing/evening shows by all means, enter the contest. For more information and a FAQ post, please check out this entry on the blog! Email your submission to info@kellibrewer.com beginning April 1-April 3 with Contest as your subject line.